One of the most important parts of running a business is not making money — but it is making a positive impact on the customers that walk through the threshold of your door. At Tactical U Firearms Training, most of our customers find us through word of mouth or by searching “tactical training courses Florida” on the internet. Regardless of how you have come to find our firearm skill development company, we are happy to have you. If you are interested in taking tactical training courses for civilians, we urge you to check out a list of our courses and sign up for the one that interests you the most as well as reflects your skill level and how comfortable you are with a firearm. In today’s blog post, we are going to switch it up a little. Instead of us talking about our tactical firearms training courses for civilians, and telling you why you might benefit from them, we will instead let you see what some of our past students have said. “Excellent training from an awesome instructor! I took the handgun fundamentals course yesterday with instructor Stephen Cohen and it was a great experience. He showed me a number of keys for correct handgun use, providing the “why” and well as “how.” We covered so many concepts with practical application on the range, that there are too many to list. This course is a must for anyone that is serious about learning the proper way to handle a handgun. Thanks, Stephen and Tactical U! Thank you for your review, Tien! We are very happy to hear that you enjoyed one of our tactical training courses, and we hope to see you back soon for the Gunfighting 101 – Essential Skills Phase II course, the next step in the handgun essentials skill development courses that we offer. We look forward to working with you again Tien! Steve Cohen is a highly experienced, energetic and passionate instructor. He is committed to his students and has an effective teaching style with an uncanny attention to detail. After completing a private gun class with him I felt more confident in my abilities to safely and more skillfully handle my firearm. Eagerly looking forward to continuing my training at Tactical U.
Armando, we are incredibly happy to hear that you enjoyed your course with Stephen Cohen, one of our professional training instructors. As to Steve’s commitment and attention to detail, we believe that attention to detail is one of the best ways to safely and effectively learn to handle a firearm. We look forward to seeing you soon for one of our other tactical self-defense and tactical shooting courses! Thank you for joining us in part one of our two-part customer testimonial blog series. 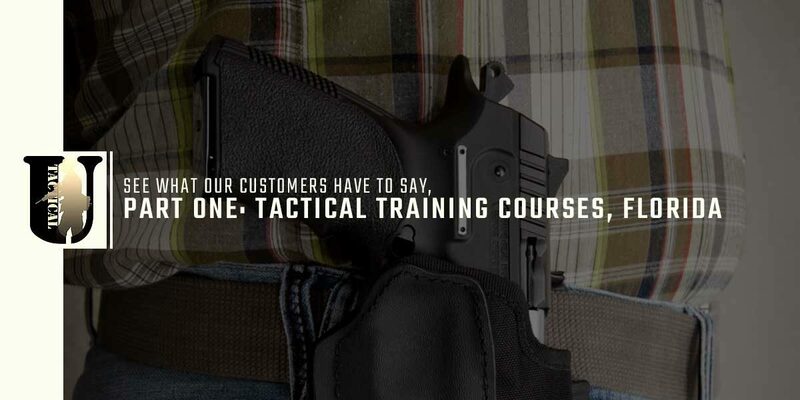 Here at Tactical U Firearms Training, we could talk all day about how our tactical training courses for civilians are beneficial to you as a shooter looking to improve your firearm skills, but the true worth of our professional training can only be told impartially by our clients. Join us in our next post as take a look at more customer testimonials. Contact us if you would like to know more about our tactical shooting courses.